Flexible payment plans. Partner discounts available. Volunteers are a critical part of an organizations success, but sometimes engaging and deploying volunteers is a little like herding cats. Created in partnership with Points of Light, HandsOn Connect brings volunteer management to new heights with a fully functioning website supported by a Salesforce backend that allows you to register and schedule volunteers & teams, report attendance, and organize service events with just a few clicks. Take a test drive and see this superpower in action! HandsOn Connect Reviews Recently Reviewed! Pros: Able to customize for your needs and add other applications. Ability to run complex reports to understand data. Cons: Limits on what you can do with your website (CMS) - you have to work within the templates provided. Overall: I mostly like Hands On Connect and find that it meets the needs of our large organization. We typically have 300 active occurrences - which is a lot of data to keep track of. The Salesforce platform takes time to learn how to use but once you are comfortable the ability to customize and create detailed reports is priceless. I have added several custom fields to help us manage our volunteers (emergency contact info, etc). I also use the Activities (tasks and meetings) feature a lot to keep track of meetings and items that need to get done. The technical support we receive from Customer support representative is great - the team responds quickly to requests and offers several drop in lab hours a week. We don't use the Salesforce nonprofit starter pack or other Salesforce plug ins (we chose to keep our volunteer database and donor database separate) but if you do already use a Salesforce application adding Hands on Connect would be really easy. I like that there is a large community of similar organizations that also use the system and that we can share tips and ideas for making our website more functional. The biggest downside is the time it takes to learn a new system and understanding how to be efficient. It is also difficult to train community partners to use the site, but recent updates have made the partner portal easier to use. I have had a lot of success getting college interns to volunteer to help manage our database and do data entry because they all want to learn how to use Salesforce. Recommendations to other buyers: It's worth taking the time to learn how to customize your fields in Salesforce. Awesome tool for managing volunteers &satistical data ,improve ease of use . Pros: Accesible 24/7, volunteer matching and recruitment process, communication wth volunteers through emails and social media, ease of genertaing reports. Cons: The screens for administrators-- letters are to small, information looks too congested/ confusing. Screen of homepage --when a partner organization opens its account page-- redistribute and design more appealing the presentation , easier to understand. Overall: Excellent features are: creating data bases, reports, attenace lists,publishing opportunities and ability to generate information for social media. Volunteers mostly find registration process easy. Many have suggested improving the graphic art presentation to make it more appealing and easier to follow the sequence for creating a profile. Non Profit orgnizations frequently lack technological expertise and limit the use of the platform, requiere tecnical assistance and tutorials. Language somtimes hinder ease of use. Would need spanish version. Changes to the platform or simply adding new features many times scare off users and create concerns of losing data and the need for retraining. Thus, changes need to be planned with adequate time frames and enough technical assistance so that the action centers can plan the way they will support the partner organizations..
Cons: If you don't know Salesforce, it can be a challenge to pick up at first. Overall: We started using Hands on Connect in 2015. While there was a steep learning curve because most of us had never used Salesforce, we are really in a groove now. We have organized clean data now and able to report on things that we never were able to--including, type of volunteering, average volunteer hours, demographics, etc. We also now are much more confident that our volunteer reporting does not include duplicate volunteers. As the Director of Volunteer Services I can also keep my eye on reporting and see where our 30+ staff are with volunteer reporting and reach out if needed. As a national organization, we are using Salesforce in other departments as well, so we are able to see if a volunteer has been a hostel guest, is a member of our organization (we have a membership program) and soon if they have donated. Comments: Hands On Greater Portland has been using HandsOn Connect for over 5 years, and the amount of work that has gone into making it the comprehensive solution for volunteer management is remarkable. We post thousands of volunteer opportunities a year with hundreds of area nonprofits and have researched all of the options out there. Nothing comes close to providing the depth of resources available to help your organization and community effectively recruit volunteers. The robust suite of CMS, reporting, calendaring, registration, attendance, and team functionality allows us to help our metro area consistently rank in the top 10 for volunteerism nationwide. The team behind HandsOn Connect is always open to feedback, and implements enhancements based on user input. These regular updates continue to improve the already impressive feature set, while extensive documentation serves as a ready reminder of how impressive a resource it is. Pros: Keeps the information organized and is easy to use. Cons: The software in general can be a little cumbersome and there could be easier ways to access information, but once you become familiar with the functions the tedium is not really an issue. Overall: I like the software. Anyone with experience with Microsoft Office should feel fairly comfortable using the software. The home page can be a little confusing but the tutorials to help customers become familiarized are both extremely comprehensive and useful. Recommendations to other buyers: I feel like the software is not yet ideal but that it is obvious that Hands On is working to make it better. The knowledge that the company designing the software is willing to keep on improving/ is truly committed to the customer experience makes it definitely worth the investment. HOC is a commitment, but a good one. Pros: The ease with which we can edit our public site and the ease with which non-admin staff can interact with the partner portal. The update to 3.0 made it so much better! Cons: The customer service could be better. Reporting could also be more intuitive. Upgrades could also be handled more efficiently. Overall: Ability to report on many aspects of our volunteer program, track everything from volunteer names to emergency contacts, recruit for positions more effectively, and have a great looking front end website. Pros: It makes our data easy to get. Can hold lots of different kind of data about different users- nonprofits, individuals, companies. Cons: There are a lot of "hidden" features that take figuring out. It can do all the things I need it to, but sometimes I don't have time to figure out how to do it. Overall: The learning curve is a bit steep, but it's generally intuitive and I have yet to have an idea that this can't do. It's really nice to say "Is it possible to...?" and get a Yes! Pros: The ease of usage and capabilities. Cons: The dated look but, now that is about to change with the new migration of the look. Overall: One of the best products on the market for volunteer management and superior customer service! I highly recommend HandsOn Connect as a volunteer management software of choice. Recommendations to other buyers: Perfect for volunteer management. Comments: HandsOn Connect allows us to manage a database of hundreds, if not thousands, of individual volunteers, potential donors, and organizational partners. Previous knowledge of Salesforce goes a long way in ease of use, but our staff is benefiting from the training provided by HandsOn Connect and tapping into the huge potential of the software. Overall: I vetted number of providers and have to say that by far HandsOn Connect offered us the biggest bang for our dollars. The staff has listened attentively to our goals, has understood the intricacies of our organization and have been willing to talk through options. We have had a number of changes along the way and with each one HandsOn Connect has graciously accepted the challenge and helped us continue to build a product specific to our needs. The system is easy to use and our staff have been able to quickly accept responsibility for loading content and managing partners. It is apparent that HandsOn Connect is not selling a product. They are helping organizations meet their mission. They are helping create a movement of volunteers. The staff is clearly passionate about service and volunteerism. We are thrilled with our partnership and look forward to serving Arkansans in a new way. Recommendations to other buyers: While the multiple layers can seem daunting and may increase costs, they also afford options and flexibility. Pros: Syncs well with Salesforce and captures the necessary information. Provides detailed listings in an easy to understand format for our potential volunteers. Cons: Need assistance from outside staff to implement major changes in the template. Limited in how forms look to our users. Pros: There is nothing about this program that is helpful, useful, or worth the money. Cons: This is the most user-unfriendly program I have ever used. They have two separate admin portals, one that doesn't work, and the other is the most confusing admin portal I have ever seen. Overall: The only way to get a human being online is to threaten cancelling the contract. Then they only spend 30 minutes with training and then send you to a list of videos, most of which are out-of-date. We have reached out repeatedly over the last two months to schedule time with you to do some more in-depth training with you on how to retrieve the reports you need. We understand that turnover rate is high with nonprofits and that is why we offer free QuickStart training for new staff members or for someone taking over the duties of a staff member who has moved on. Pros: User friendly. And upgrades are made in a timely fashion. Better to go for the Lex than the Kia, you get what you pay for. Cons: There are so usages and functionality it is somewhat hard to keep up unless you are using it everyday. Overall: From day one, you will feel confident that you have a team by your side. They even provide monthly "How To" webinars to brush up on the system. With their customer service team there is never a "dumb question." They are so competent it is well-worth the money. Pros: Customization and content management features. Cons: I would like to be able to add some additional fields to categorize users. Overall: HandsOn Connect provides excellent ongoing customer support. Not only can you speak with someone directly, but they also store tons of training videos online for users to go back to and reference for those tasks that maybe you only do every once in a while during reporting season. The content management system is very easy to use as well. If anyone has experience with Salesforce, then the learning curve will be significantly shorter. However, I came in with no Salesforce experience and still found it pretty easy to pick up. The product is not functional. We are looking at other options. Pros: Looks like it might be a nice product but HOC can't make it work for us. Looks like it might be a nice product but HOC can't make it work for us. Looks like it might be a nice product but HOC can't make it work for us. Cons: Our volunteer site has been dark for 6 weeks now due to HOC not being able to make the transition from our previous host. Overall: None so far. Looks like it might be a nice product but HOC can't make it work for us. Looks like it might be a nice product but HOC can't make it work for us. You mentioned "Our volunteer site has been dark for 6 weeks now due to HOC not being able to make the transition from our previous host." Please contact HandsOn Connect directly. There must be some miscommunication. We would never leave a customer in the dark for six weeks. Please contact me directly at melissa@handsonconnect.org or (256) 580-6177. Our goal is to help you do more good. Please give this feedback directly so we can. Comments: Hands On Connect continues to hear their customer's needs and actively respond in the technology. Their staff offers open labs and you get to know them like they are a part of your nonprofit's family. 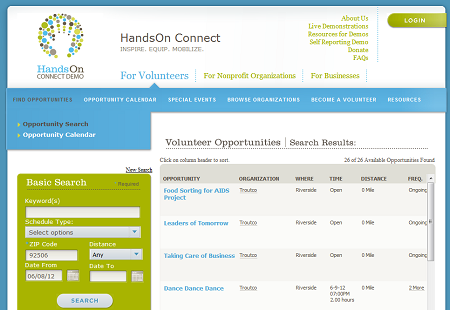 I would highly recommend using Hands on Connect for any organization wishing to manage their volunteers in an efficient, personal and ever-evolving solution. Comments: I started using HOC about 6 months ago when I started my position. The 3.0 version is extremely easy to use - you can upload images easier, rearrange the layouts easier, save pages for future use and many other things. The support I've received from my representative has been quick and helpful! Comments: HandsOn Connect was been a great partner with the custom build out of our organization's database using Salesforce. The quality of work and customer service have been stellar. The willingness of the team to make requests happen in a timely manner has been greatly appreciated. HandsOn Connect is where our community goes to connect to volunteer opportunities. Comments: HandsOn Connect is a wonderful tool for matching agencies in need of volunteer support with individuals and groups seeking opportunities to engage in the causes they care about. The search and calendar are useful tools to help navigate the many opportunities posted. Pros: There is a lot of data you can capture and you can create specific reports. Overall: I tried out the Demo with support staff a while back. She was great at explaining the basics on HandOn Connect. Unfortunately this is something our small nonprofit could not afford at this time. It has everything we'd need in a volunteer management platform as well as the community partners aspect. Comments: I have had great experiences with HandsOn Connect. Their staff and customer service are very friendly and always there to help. Comments: Maid the migration so easy and fun, the main thing was no down time. Pros: Easy to use, customizable, and great customer service. Overall: My workplace has recently been working with Hands on Connect to help run a few of our programs. The logistics are easy to understand, and they make the process in our programs flow seamlessly. I have been impressed with the program and the training we received. I am excited to continue to use this program!